In recent years content creation and output have quickly moved from HD to 4K and beyond, making 10Gb Ethernet the new data transfer standard for post-production shared storage workgroups and other bandwidth intensive workflows. Very affordable 10Gb Ethernet Switches with RJ45 (copper) have significantly reduced the cost of setting up a 10GbE infrastructure, resulting in very rapid adoption. Even the new iMac Pro™ includes 10Gb Ethernet as its standard network interface. 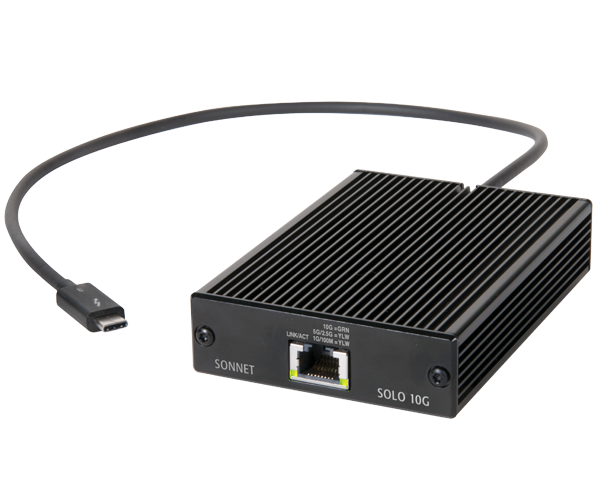 Now, for computers with a Thunderbolt™ 3 port, there is an equally affordable Thunderbolt to 10Gb Ethernet adapter—Sonnet’s Solo 10G™ Thunderbolt 3 Edition adapter, a powerfully simple solution for adding blazing-fast 10GBASE-T 10GbE network connectivity to any Mac® or Windows® computer with Thunderbolt 3 ports. The Solo 10G adapter supports the NBASE-T™ industry-standard of 2.5G/5G link speeds, which enables greater than Gigabit Ethernet speeds over CAT 5e cabling when used with an NBASE-T compatible switch or router.